For those who think the Fed is printing money willy nilly, stoking future inflation, think about what that means. Companies are the only organizations seemingly revaluing their “currencies”. More money from central banks chasing fewer equity securities means prices should be higher, as they are now. Is that how monetary policy is working at the moment? Yes and no. The Fed has printed money to buy bonds, but hasn’t said it will keep all that new money in circulation. What is Fed policy? It’s whatever our expectations are. If we collectively expect the Fed to reverse QE at some point in the future, then it’s not really inflationary. It’s as if a company discovered a vast hoard of gold and promised to bury the same amount in 5 years time. What would happen to gold prices in that hypothetical? They should stay the same. They may rise if you didn’t believe they’d actually rebury the gold. But central banks around the world have spent 30 years convincing us that they will, in fact, rebury their newly-created money. In essence, Fed policy is 0%-2% inflation. There’s no dual mandate. There’s an inflation target with a promise not to go negative. So we have a put against economic collapse, but no promise of overall reflation from the 2008 trough. But stocks are still high. Why is that, you ask? Because low inflation combined with a guarantee of positive economic growth is the best of both worlds. Yields will stay low for a long time, but we won’t risk a 2008-style economic collapse. Maybe we’ll have a recession soon. That could be the case, but it won’t be one caused by an overheating economy causing lots of inflation. How do I know this? Looking at Japan over the last 25 years gives us one answer. The graph below gives us another. 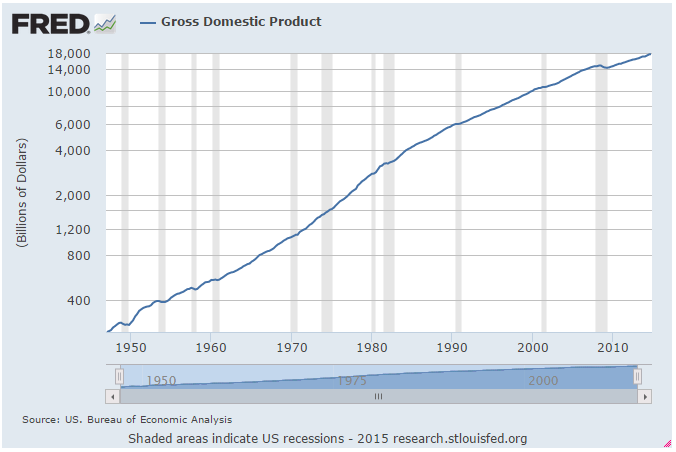 GDP sloped more steeply upwards in the 1970’s as Fed policy was too loose. Since 1980 with 2% inflation the target, the Fed compressed GDP growth further and further, but to the point where now we’re still far below trend after the 2008 panic. Things only feel good now because we’ve stopped hitting ourselves in the head with a hammer. The only risk is that the Fed picks up the hammer again (higher interest rates) and starts hitting us with it again.